The policy is for Baptisms to take place as part of the Parish Eucharist on a Sunday morning. Eligibility requirements are that the candidate, or parents in the case of a child, either live in the parish or have worshipped regularly at the church. 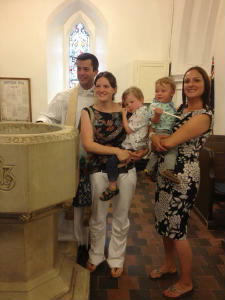 At Cookham Dean we will also offer baptism where the candidate’s family have a connection with the church, e.g. married there or grandparents worship at the church. In such cases, permission will need to be sought from the parish in which the candidate normally resides. The liturgy used is a special adaptation to get the maximum engagement from both Baptism families and the regular congregation. All parents and if possible godparents are expected to take part in preparation meetings.